Bethlehem’s SteelStacks campus received the Rudy Bruner Gold Medal Award for Urban Excellence on Sept. 7. Bethlehem’s SteelStacks Arts and Cultural Campus has amassed more than 30 awards since opening six years ago, from regional and statewide recognitions to national and even international awards, according to Tony Hanna, executive director of Bethlehem Redevelopment Authority. But the campus received arguably its most prestigious honor this week, when it was awarded the Rudy Bruner Award (RBA) for Urban Excellence, which celebrates transformative places distinguished by physical design and contributions to the economic, environmental and social vitality of America’s cities. 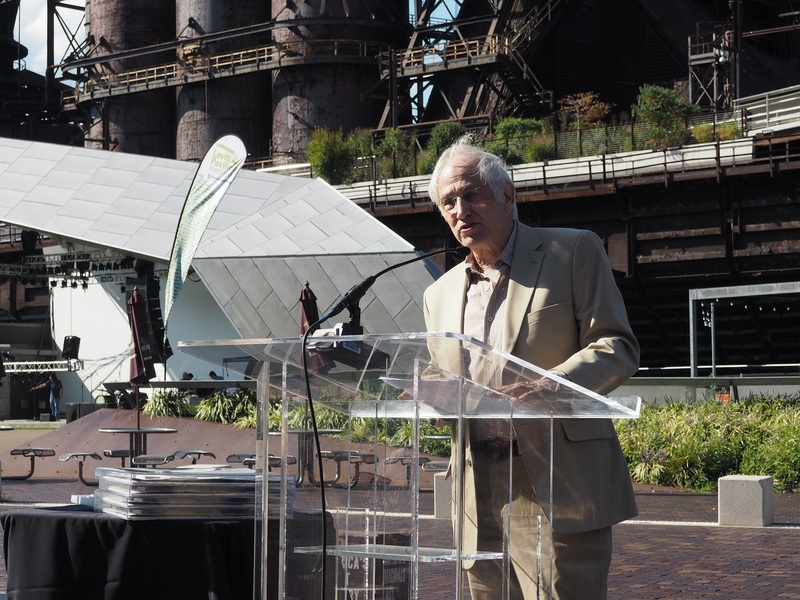 More than 100 people attended the award ceremony at SteelStacks on Sept. 7, with the towering blast furnaces of the former Bethlehem Steel serving as a backdrop. 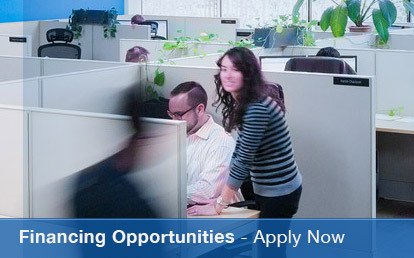 The award includes a $50,000 prize to further enhance the project. Simeon Bruner, RBA architect and founder, said the SteelStacks campus speaks to the essence of the Rudy Bruner Award because it involved the city of Bethlehem taking a economic and communal loss into a positive cultural and historical asset. Simeon Bruner, architect and founder of the Rudy Bruner Award, speaking at the SteelStacks ceremony. A nationwide committee of urban experts chose the $93.5 million SteelStacks campus for the Gold Medal award, selecting the Bethlehem project over significant competing projects in such major cities as Boston, Chicago, Los Angeles, and New Orleans. Eighty-three projects in 27 states have received the RBA since its creation in 1986. Past winners include the Brooklyn Bridge Park, New York’s The Times Square; Boston’s Harbor Point, Seattle’s Pike Place Market, the Children’s Museum of Pittsburgh; and the Lower East Side Tenement Museum in Manhattan. Kassie Hilgert, President and CEO of ArtsQuest, noted that Bethlehem, Boston, and San Francisco are the only cities in the country have won both an RBA and the Urban Land Institute Global Award for Excellence. The SteelStack campus received that prestigious real estate development award in 2014. SteelStacks was selected for the RBA Gold MEdal over such competing projects as the Chicago Riverwalk, the La Kretz Innovation Campus and Arts District Park in Los Angeles, the Bruce C. Bolling Municipal Building in Boston, and the rehabilitation of 26 historic homes in New Orleans. All four projects were named 2017 Silver Medalists. 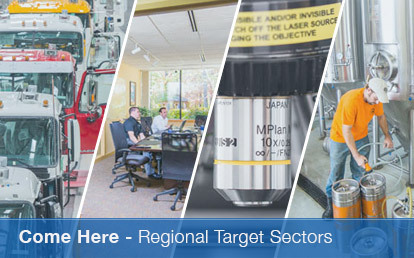 Finalists and medalists are determined through an in-depth evaluation process by the selection committee involving input from the award application, site visits, interviews with project participants and community members, and committee discussions. 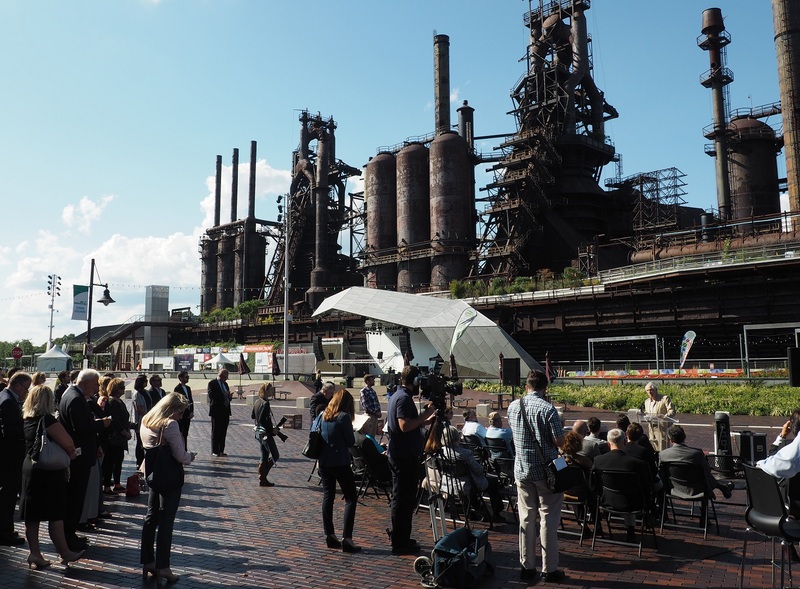 Located on the former Bethlehem Steel site, the 9.5-acre SteelStacks campus includes a public plaza anchored by the blast furnaces, as well as the Levitt Pavilion outdoor amphitheater, Bethlehem Visitor Center, ArtsQuest Center, PBS39 public broadcasting center, and Hoover-Mason Trestle Park. 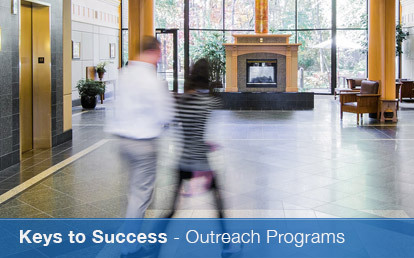 The campus hosts 1.5 million visitors annually for events. It was designed by WRTof Philadelphia and developed by a consortium led by the Redevelopment Authority of the City of Bethlehem. “I remember as a budding architect visiting Bethlehem and being kind of overawed by the enormity of the place and the hard work that went into making structural steel,” said Bruner, who noted he still uses a piece of iron ore on his desk as a paperweight. The 2017 RBA selection committee included Knox White, Mayor of Greenville, South Carolina; Kimberly Driggins, Director of Strategic Planning with the City of Detroit Planning and Development Department; David Lee, President of Stull and Lee Inc.; Willett Moss, Principal with CMG Landscape Architecture; Deidre Schmidt, President & CEO of CommonBond Communities; and Scot Spencer, Associate Director for Advocacy and Influence with the Annie E. Casey Foundation.